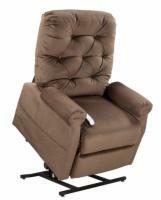 There are four types of lift chair recliners, all of which vary in their ability to recline to different positions. 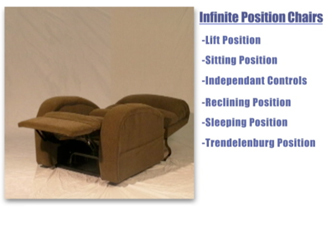 These include two position, three position, infinite position, and zero-gravity lift chairs. Please remember when you are selecting your lift chair that the position refers to how far back the chair reclines, but you can still adjust to any point between the upright position and the maximum recline capabilities of your chair. 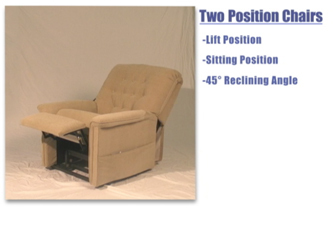 2 position lift chair recliners provide users with the mechanical lift function and reclines to an approximate 45-degree position. There chairs are perfect for those who want to relax in their living room and enjoy the convenience of an extra boost when stitting and standing. Please note that these chairs are able to recline to anywhere in between the upright and reclined position. 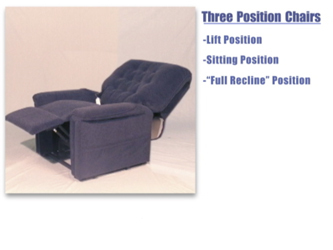 3 position lift and recline chairs support users when sitting down, help them to stand, and also adjust to a "full recline" to provide a more relaxing position. The back of the chair moves with the footrest to offer you the added comfort of leg support while you are reclined. 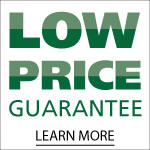 Three position lift chairs are popular for a reason; they provide the user with great features at a price that’s affordable. 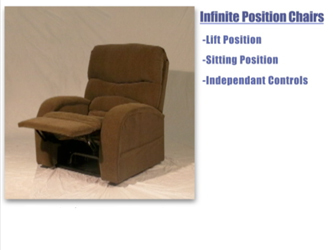 With an infinite position lift and recline chair allows you recline to a flat position. It also has individual motors for both the back and the footrest, so you can adjust each part of the chair seperately in order to find the most comfortable position. This chair is great for those who are looking for top-of-the-line features and chair they can sleep in. Golden Technologies’Zero Gravity lift and recline chairs have all the same features that an infinite position has, but they also allow you to recliner even further backwards. With this added recline capability, you will certainly feel the benefits. Due to the unique design of these chairs, it relieves virtually all pressure on the lower back, while supporting your entire body and expanding lung capacity as well as improving your circulation.